KODIAK BEAR STOPPED —- UDAP Bear spray is for real! Myself and four friends decided to take a leisurely stroll across Kodiak Island after a long summer of commercial fishing. 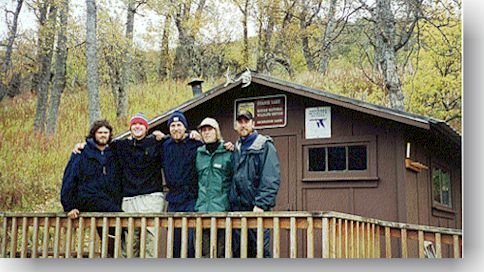 A few of us including myself had some backcountry experience in Kodiak and were well aware of the number of bears, and their incredible size. I had personally ran into about 7 other bears in hikes and sport fishing trips on the island. Every experience ended peacefully with the bear usually fleeing after spotting us. I had talked with numerous people who had done hikes on the island without a firearm and felt reasonably confident with the size of our group to leave the rifle behind. One of my friends thought otherwise and decided we at least needed a can of UDAP pepper spray. We all laughed at him for “wasting” his money. The hike which was to last 12 days began wonderfully. The going is tough in the Kodiak bush for there are no trails. Fortunately there are so many bears on the island for we fully utilized their vast network of highways. We were approaching Uganik Lake which was to be the end of our journey and pick up spot. I was somewhat disappointed that we had seen no bears on the trip, but that was soon to change. As we descended down into the Uganik flowage we were following an old trail through some thick alders on a very steep incline. I was at the front of our group bushwhacking with my machete as I came into a clearing. About 150 yards straight down a brown flash caught my eye. I was ecstatic finally a bear and at a relatively safe distance. The bear moved slowly into the clearing sampling the air as I began to excitedly call to the rest of my group and grab for my camera. Before I could get my camera out I saw another smaller ball of fur join the mother. The sow took one more sniff and began bounding up the ridge, as I began too shout loudly. Now the time frame which all the events took place in has been long disputed by every member in our group (adrenaline tends to skew time like that). Within a few seconds she was halfway to me. I became increasingly nervous and yelled at the top of my lungs. The sow continued up the ridge with incredible speed and agility. I quickly decided I was not going to stand there by myself. I figured my odds would increase from nothing to one out of five if I could get back to the rest of our group, who were a few yards behind me. We huddled together jockeying for position (believe me no one wanted to be at the front of our pack). We must have looked as large as a boar with all our packs and gear, and I felt somewhat confident that the sow would be deterred, as we yelled every obscenity imaginable to her. We eventually lost sight of the bear, but she remained within hearing distance as she rumbled and crashed through the thick alders. The sow eventually worked its way above us and began to descend upon our steep perch. She got within 15-20 feet and stopped briefly to snarl, snort and bounce upon an alder that was separating her from us. At this point I attempted to light my flare as a last defense. It was a dud, maybe I was just too nervous and figidy, but I’d like to think it was the latter. There was no time to reach for another so I stood poised with my machete. The only thoughts going through my head were “I wonder what this is going to feel like.” At this point fear wasn’t even an option, the adrenaline had induced a slow motion type of analysis and curiosity. The sow bounced on the alder a few times and made her final charge toward us. I had completely forgotten about Todd, and his bear spray, but luckily for us he stepped up and sprayed, the approaching sow with a large misty cloud. The sow which was only about 10-15 feet above us stopped directly in her tracts, snorted, sneezed, pawed at her head and eyes then turned directly around and we didn’t see her again. We hurriedly continued to the welcomed refuge of the cabin at Uganik Lake and enjoyed the rest of our vacation. I just want to reiterate that UDAP Bear spray is for real, I’m a walking living testimony to its success. I won’t go into the bush without it and require anyone else with me to also have a can. I’m afraid of what would have happened if we had a rifle, for there would probably be a dead bear on our hands and an abandoned cub. If this spray can work against some of the largest bears in the world I’m convinced it will work in almost any situation. Thanks UDAP for making a lifesaving good product.